Every day is something day, but forget clown day, because clowns have an entire week, from Aug 1 – 7 every year. It was even written into American law by President Nixon. To celebrate, here are 15 facts about funny men! 1 – The word clown is believed to come from the Icelandic word klunni, meaning a clumsy person. 2 – The earliest record of the word clown dates from around 1560. 3 – Clowns are nicknamed Joeys after the early 19th century pantomime star Joseph Grimaldi. 4- Grimaldi was the first panto clown to wear white face make-up instead of a mask. 5 – The full name of Krusty the Clown in The Simpsons is Herschel Shmoikel Pinchas Yercham Krustosky. He’s voiced by Dan Castellaneta. 6 – The declaration of International Clown Week was passed into US law by President Richard Nixon on August 2, 1971. 7 – Traditional clowning centres on the relationship between the ‘whiteface’ (the straight man) and the ‘auguste’ (foolish or mischievous clown). 8 – All straight man/funny man comedy double acts, such as Laurel and Hardy, are derived from circus clowning. 9 – The first circus clown was called Mr Merryman. 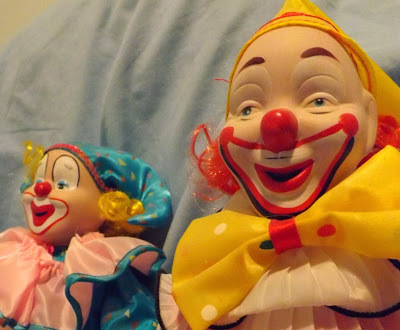 10 – Coulrophobia describes the fear of clowns. 11 – The world’s oldest clown society, Clowns International, was founded in 1947. 12 – The first killer clown in fiction appeared in the 1892 Italian opera Pagliacci. 13 – Johnny Burnette had a hit with Clown Shoes, written by PJ Proby. 14 – Ronald McDonald was first played by Williard Scott in a 1963 TV commercial. 15 – Serial killer John Wayne Gacy was a clown known as Pogo. This post originally appeared on the author’s blog Circus Mania.